BRIDGETOWN, Barbados, Jul. 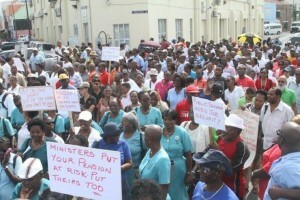 24, CMC – A nationwide protest called by trade unions and the private sector has won the support of thousands of Barbadians who turned out on Monday urging the government to roll back the increase in the National Social Responsibility Levy. The protest is jointly organized by the Barbados Private Sector Association, the Barbados Workers’ Union (BWU), the National Union of Public Workers (NUPW), the Barbados Union of Teachers (BUT) and the Barbados Secondary Teachers’ Union (BSTU). On Sunday, the National Union of Public Workers (NUPW) called on all members to participate in a national march and rally . The umbrella organisation said it informed, in writing, the head of the Civil Service and and the permanent secretary in the ministry of the industrial action. The NUPW said it warned the government at a pre-budget meeting that the union would not support increased taxes. However, in response to the protest action, the Prime Minister in an address on Sunday urged nationals not to be taken for a ride by the newly found alliance between labour and the private sector. Addressing a luncheon given by the ruling Democratic Labour Party’s Christ Church West branch , Stuart predicted that the “new-found fellowship” between the private sector and the trade unions would not last.